This renowned and admired artist has made Mallorca her home. 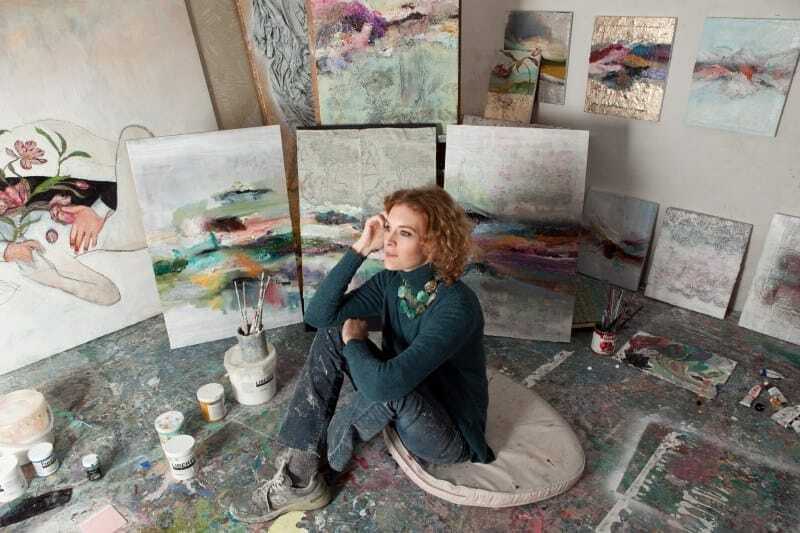 The artist Natasha Zupan was born in Georgia (USA), brought up in Europe, and studied art at Yale University. Talent is an intrinsic part of her DNA, thanks to her father – the prestigious international artist of Slovenian origin, Bruno Zupan – and her beautiful mother, Jane. Natasha lives in Valldemossa in a stone house, with an eclectically decorated interior, which she purchased from the Swarovski family. After numerous exhibitions in Boston, California, Milan, Stockholm and New York – attracting celebrities like Michael Douglas, Catherine Zeta-Jones and Claudia Schiffer – the artist has been featured in the Italian ‘Vanity Fair’ magazine and acted as muse for the famous fashion label Larusmiani, as well as being commissioned by Mattel to produce a painting about Barbie, to celebrate its 50th anniversary. What was it like as a child travelling all over the world? My father is an artist and we divided our time between Mallorca, Paris, Venice and the US; he was constantly chasing the perfect light, as he paints landscapes. That meant that I changed school more than ten times, but it has given me a very open perspective on so many different cultures. And you decided to make Mallorca your base. We would always come back to Mallorca to spend the summer. I never imagined living here but I came here to rest after a divorce and decided I wanted to plant some roots and so I bought a house that I could make into a home. With the internet and regular flights to cities the world over, you can live in Mallorca and feel like you are in a great metropolis, whilst enjoying the peace and tranquility that an artist craves. I travel constantly in search of inspiration: I live three months of the year in New York, and I attend the Venice Biennale, Art Bassel in Miami and many other events. I do lots of research and then I come back here to develop my art. Your father had a fundamental role in deciding your career. Obviously, it’s genetic. I already knew I wanted to be an artist when I was six years old and I used to copy Picasso. It came naturally to me. My father always says “the apple never falls far from the tree”. You change style very often. Yes; it is part of the dialogue. I speak five languages and I have come to know many different cultures. One’s style is nothing more than an artistic dialogue, a way of representing things. Aesthetics have always been a part of my life. As a young girl I studied with Xim Torrents Lladó and I used to travel to Paris and Venice. There are many celebrities amongst the people who own one of your paintings, could you mention a few? What is your most recent work? Some months ago I presented a joint exhibition with my father called “Zupan & Zupan” at the Galerie D’Orsay in Boston, which was a great success. It is entitled “White Lies”, although I prefer not to reveal where it will be exhibited yet. It is a collection of white paintings which address the lie that is art. It brings together all my different styles and is a conceptual dialogue about the representation of objects. ‘Vanity Fair’ Italy published an article about you and Larusmiani went on to adopt you as their muse for their publicity campaign. How did that all come about? Larusmiani is a company which produces fabric for some of the most important Italian fashion labels and I incorporate the juxtaposition of fabric quite a lot in my paintings, a technique which is based on surrealism. I combine the contemporary with aspects from the eighteenth century. The brand’s heir is Guglielmo Miani (his grandfather was a tailor whose clients included the Duke of Windsor and Charlie Chaplin) and he is also the acting president of the Via Montenapoleone Association. He met me at the Salon Mobile in Milan at which he was exhibiting a Swarovski lamp that I had designed. At a dinner, he was with his new designer Liborio Capizzi (ex-creative director of Gianfranco Ferré) and they approached me and asked if I would be interested in being the muse for the new women’s collection. They knew I used a lot of fabric in my paintings so they gave me a lot of different materials and I made them a painting for their flagship store in Via Montenapoleone in Milan. Some representatives from ‘Vanity Fair’ came to the presentation, loved my painting and asked me if they could publish a feature about my profession and life. Your godparents are also artists. Marilyn and Ivan Nagy are my godparents; they were great ballet dancers, and have now retired to Mallorca. Ivan was Margot Fontaine and Natalia Makarova’s favourite partner and he even directed the English National Ballet, of which Princess Diana of Wales was patron. Their close friends included many great artists such as Pavarotti. They were guests at the wedding of Prince Rainier and Grace of Monaco, alongside Maria Callas, and my godmother gave me the dress she wore at the wedding which I later turned into a painting. She has had a fascinating life, and been very famous and now she lives here. Ivan always tells me that an artist never changes who he/she is, no matter how famous he/she becomes. My father and Ivan have been the most dominant male figures in my life. We hope you have found this article about the Natasha Zupan – The Beauty of Life full of Passion useful and that you have many memorable stays in Mallorca as a result of our recommendations.